There are far too many RF (Radio Frequency) connectors in use. No doubt there are good technical (or commercial) reasons for each design, but it does get frustrating when you haven't got the correct mating connector, adaptor or termination. I have standardised on 2 types of connector for general purpose use; the BNC connector; and the N-type connector. 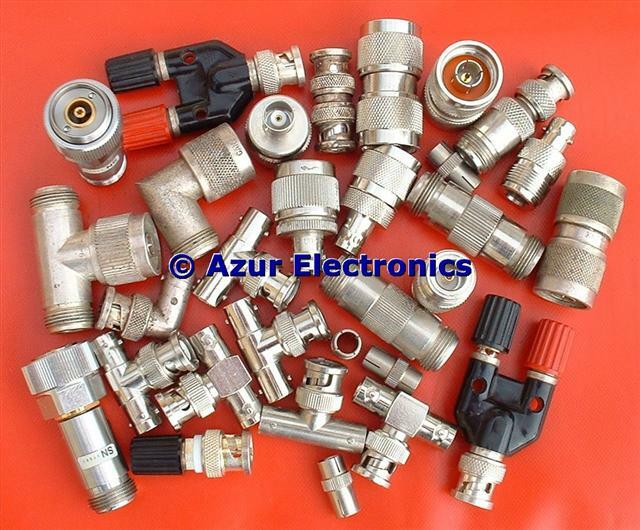 Other types of connector that are used in my test equipment are: APC-7, SMA, SMB and SMC. These connectors are all 50Ω impedance and used in the frequency range of dc up to 18GHz. For some connectors there are 75Ω versions, often used in telecomms and video applications. These are not compatible and often not inter-mateable which can damage the connectors. Check that your connectors are the 50Ω versions. Using the correct connector for the frequency being used can be critical for measurement accuracy. Check the manufacturer's specification for attenuation and frequency.